Florida is known as the sunshine state, but that doesn’t mean that it won’t rain. In fact it can rain a LOT in Florida, but the difference is that the rain storms don’t tend to last very long and as the weather is so much warmer than the UK, you dry off so quickly and just carry on with your day. 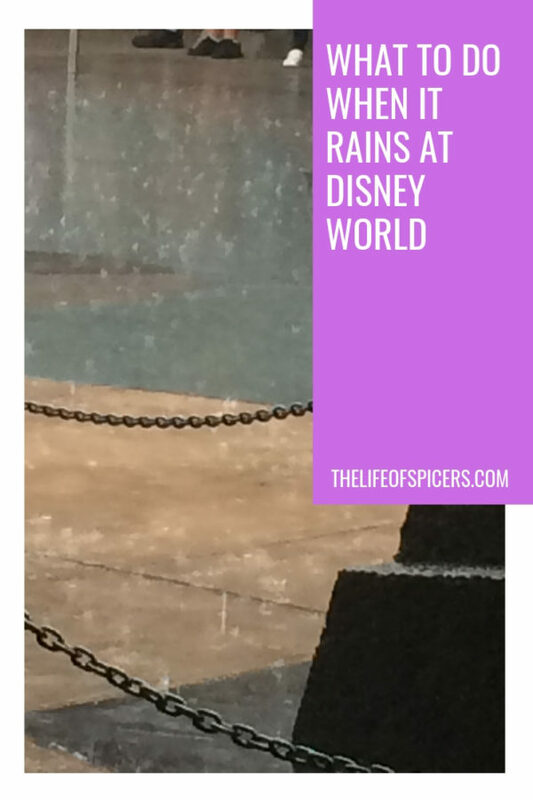 What do you do when it rains at Disney World? Florida’s rainy season is between June and October where 70% of the years rain will fall. This is coupled with the hurricane season that mainly happens between June and September, so if you’re visiting between June and October, expect rain and storms whilst you are there. When we arrived in July 2014, the first day the rain arrived at 4pm which was almost on cue for the daily 3-4pm storm that we were told would happen. Usually the storms will last an hour or so, perhaps less, but this one went on all night, and we soon understood that when it rains at Disney World it really does rain! We were wondering if we were jinxed, but whilst it was a little scary being out in the thunder and lightning we were well protected and just carried on as normal. I can honestly say looking back to our 2014 holiday, I don’t remember the rain spoiling anything for me, despite us having lots of rainy days. Our second visit was in April 2016, and it rained on our second morning before we woke up, and on our last evening as we were packing. The rest of the two weeks were dry and sunny. Our third visit in August 2017 saw rain almost every day, but somehow we missed it most of the time. This is a short video of the rain storm from our hotel room at Caribbean Beach Resort on the first day we were there. I highly recommend buying a poncho before you get to Disney World. We bought some from Amazon and they are so much cheaper than buying them from the parks. They will fold back up into their packets when dry and you can re use them for the duration of your holiday. If the rain started to fall we put on our ponchos and carried on with our day if we were in the parks. We may have searched out some cover but the ponchos help you stay dry whilst you are walking from one place to another. It was great as well to see people diving for cover that often the queues for the rides went down a lot when the rain started, and as long as there was no thunder or lightening the rides would stay running through the storm. If being out in the rain isn’t for you, then choose the time it rains to visit an indoor attraction. We had just come out of Monster’s Inc Laugh floor when there was a big storm, so we raced across to Stitch’s Great Escape that didn’t have any queues. I don’t rate the ride but it was dry inside and meant we weren’t getting wet. There will always be indoor attractions to go to if you get stuck in a park when it starts to rain. The People Mover is a great place to rest your feet and escape the rain for fifteen minutes. If you’re hungry, use the time it’s raining to get some food. You will stay dry and re fuel for when the rain passes and you can carry on with your day. 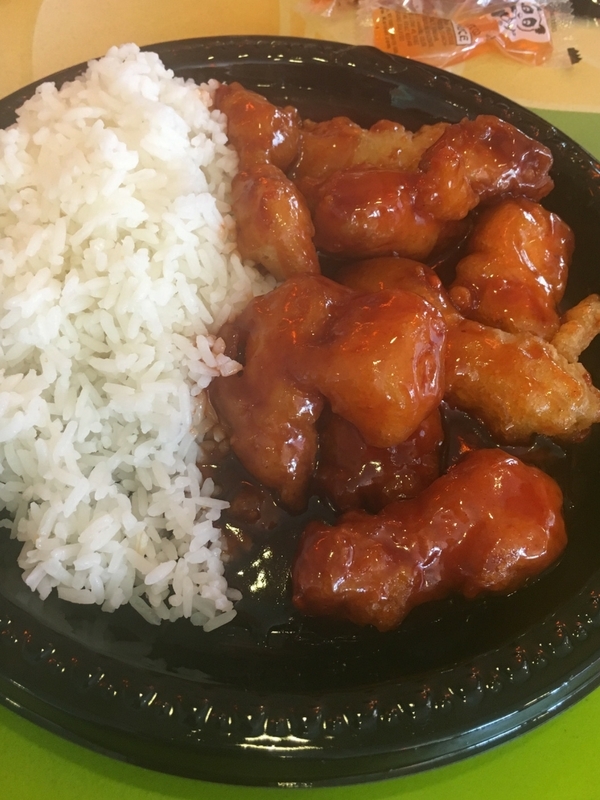 Perhaps you could visit a character restaurant such as Be Our Guest in Magic Kingdom, Garden Grill in Epcot or Tusker House in Animal Kingdom. If you’re in Magic Kingdom, did you know you can walk all the way down Main Street through the Emporium shop? It’s a great way to browse as well as get from one end of Main Street to the other if you’re leaving the park. Elsewhere there are plenty of shops around and you may discover one you didn’t know was there as you are browsing. 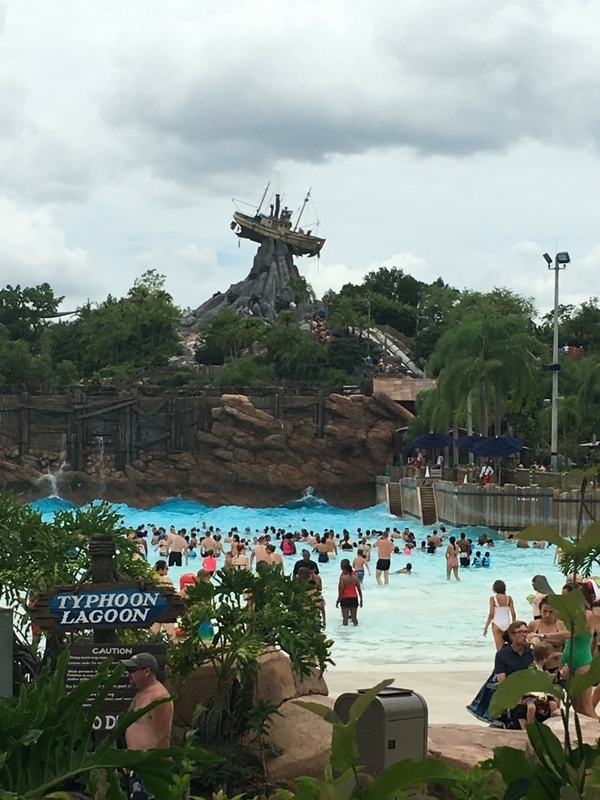 If you’re already wet, then this might be the time to go on those water rides such as Splash Mountain (MK), or Kali River Rapids (AK). As long as the rides don’t close due to inclement weather (thunder and lightning) then you’ll probably find the queues are shorter and you won’t need those Fastpasses. 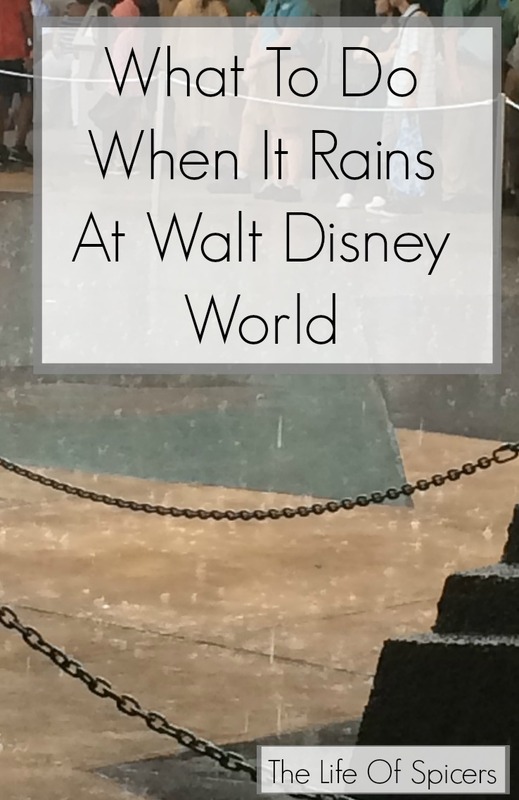 What’s your favourite thing to do when it rains at Disney World? If you’re reading this and you’ve already booked your holiday, then check out ways to surprise the kids with your holiday, and if you’re wondering whether Memory Maker is worth the money then check out my post covering what I thought. 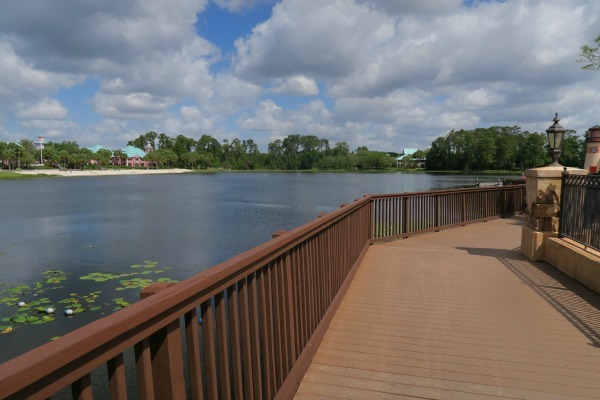 We stayed at Caribbean Beach Resort during our first and second visit and thought it was so great we are staying there again on our next trip in 2017. 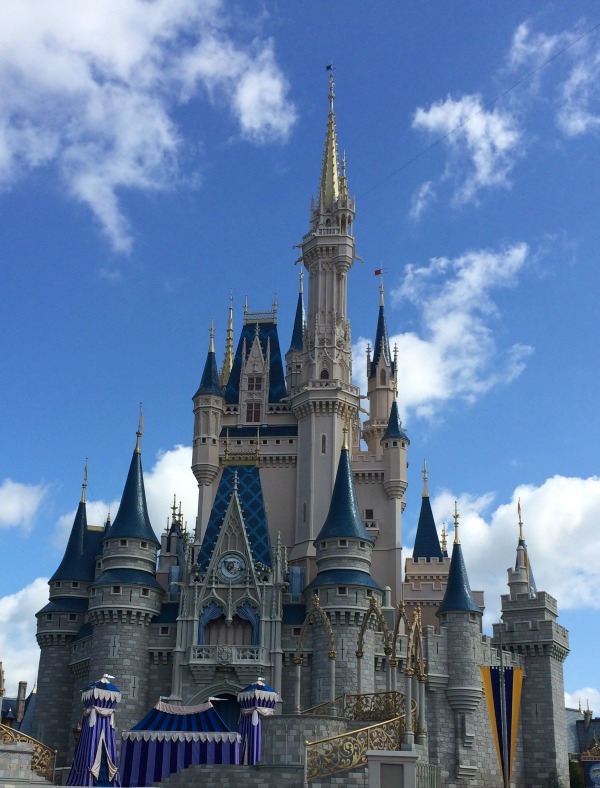 Not sure what to Fastpass+? Check out my ideas. The best thing about the rain in Orlando is that the rides get quieter!